The development rush in Westlake is real, and now one dentist even wants in. 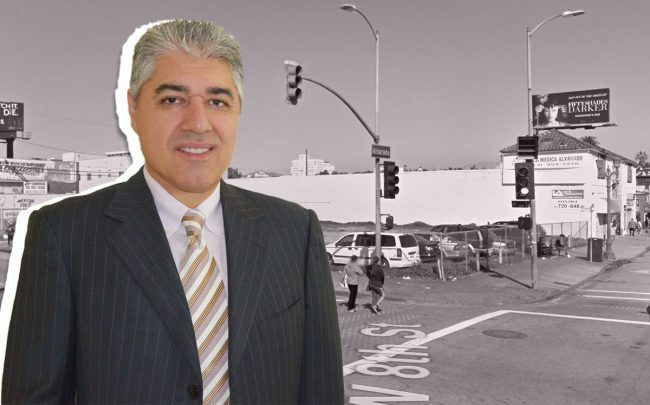 Dr. Alireza Mossavaghi has filed plans for a 57-unit mixed-use project in the neighborhood. Acting through Alvarado Center LLC, Mossavaghi wants to build the project at 2101 W. 8th Street, at Alvarado Street. The seven-story project would include 5,900 square feet of ground floor retail space and 43 parking spaces. Massavaghi is taking advantage of the site’s eligibility for development incentives through the city’s Transit-Oriented Communities program, because of the site’s proximity to the Westlake/MacArthur Park Metro station. The filing seeks a reduction in total open space, common open space, and side yard setbacks. The TOC program provides developers with incentives including density bonuses — or the option to add more units — for projects that include affordable units. The program has been popular across the city and especially in Westlake. The area had already seen a steady flow of new development projects before the TOC program took effect in late 2017. Between 2011 and 2017, the total assessed dollar value of property in Westlake grew from $4.6 billion to $6.7 billion. Last month, Westside-based developer Safco revised a project on South Coronado Street to take advantage of the TOC program, upping its overall unit count from 44 to 77. The firm is also using the incentive to build a 130-unit development on Burlington Avenue in Westlake. Leading Koreatown developer Jamison Services has taken up a series of projects in the area over the last several years, including converting a 13-story office building and developing a 644-unit project in a partnership with Hankey Investment Company. Construction is now underway, according to Urbanize. There have been some stumbling blocks along the way. In November, tenants in three apartment buildings in Westlake refused to pay rent, claiming they were being forced out by landlords looking to flip their properties for more money.